Visible light image of spiral galaxy M81 taken by Subaru Telescope's Prime Focus Camera. A halo-like cosmic structure around a well-known spiralgalaxy may help uncover clues into the formation of galaxies, though it has alsoraised new questions over how the galaxy differs from our own Milky Way. The extended structure of the Messier 81 (M81) galaxy,which has many hallmarks of a galactic halo, was spotted by astronomers using theSubaru Telescope at the National Astronomical Observatory of Japan. Until now, ground-based telescopes have only observedindividual stars in the halos around the MilkyWay and Andromeda galaxies. But the enormous light-gathering power ofSubaru Telescope's 27-foot (8.2-meter) primary mirror and the widefield-of-view of its Prime Focus Camera (Suprime-Cam) enabled the telescope toprovide evidence of a faint, halo-like structure extending beyond M81's bright diskof stars. The Subaru telescope's detectors can pick up light in thenight sky that is more than 100 times fainter than what can be seen by theunaided human eye. That sensitivity allowed the telescope to spot individualstars, observe enough of them to identify what could be M81's halo, and analyzeits physical properties. ? A galaxy's halo of stars is usually spherical in shape andappears to extend beyond the galaxy's main disk. 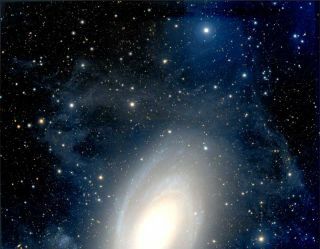 By studying the differences inthis extended structure in M81, when compared to the Milky Way's halo,astronomers can analyze the variations in the birth histories of different spiralgalaxies. So far, thefindings of the Subaru telescope defy exact classification of M81's extendedstructure as a halo in the traditional sense. And while the spatialdistribution of its stars resembles the Milky Way's halo, M81's"halo" also differs from the Milky Way's in other respects. Measurementsof the total light from all of M81's stars, and analysis of their colors, pointto estimates that M81's "halo" could be several times brighter andcontain more processed materials ? nearly twice as much mass in the form ofmetals (all elements heavier than helium), than the Milky Way's halo. Astronomershope to use observations of both galaxies to determine how the differencesbetween them arise and decide if the fundamental definition of a galactic haloneeds to be updated. M81 is one of the largest galaxies in the M81 Group, a groupof 34 galaxies located toward the Ursa Major constellation. Located 11.7million light-years away from Earth, it is one of the closest groups to theLocal Group, which is the collection of galaxies that includes our own MilkyWay. ? The mostprominent of the existing models predicts that galaxies are built up when they merge with many othersmaller galaxies that orbit within their gravitational sphere of influence.This rather chaotic growth leaves behind a halo of stars around massive spiralslike in the Milky Way. Thedifferences between the Milky Way's halo and the structure around M81 add moresupport to the growing body of evidence that the outer structures of apparentlysimilar galaxies are actually much more important and complex than they hadpreviously thought, Subaru telescope astronomers said in a statement.